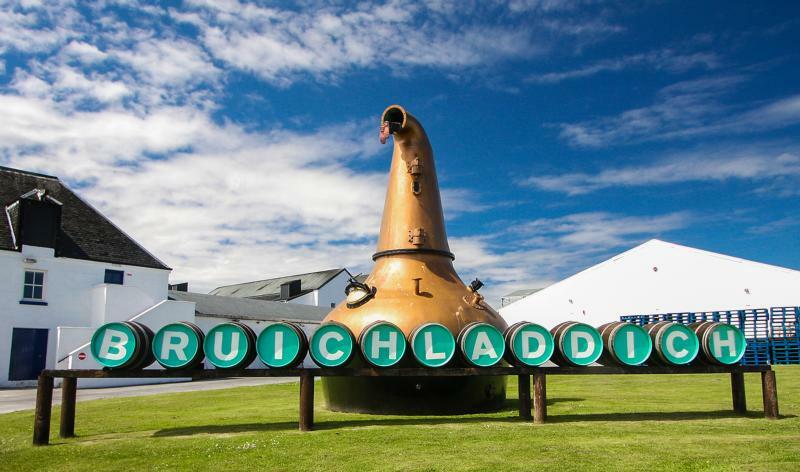 At Bruichladdich, we believe the whisky industry has been stifled by industrialisation and self-interest – huge organisations have developed that require a stable status quo to ensure that their industrial processes can run to maximum efficiency, producing the maximum "product" with the minimum input and variation, all to the lowest unit price. We believe in variety, in chance, in progress, in irrationality, in a stubborn refusal to accept prescribed "process"; we believe in following the distilling Muse wherever it might take us. Above all we believe the world needs an antidote to homogeneity and blandness. Since our first spirit ran from our stills on 11.09.01 we have been on an adventure – sometimes a white-knuckle ride, but a journey that has seldom been dull, often a challenge, throughout a joy and a thrill. Our raw ingredients are paramount. We use 100% Scottish barley - we believe it's called "Scotch" for a reason. We are the major distiller of organic barley in Scotland and have been instrumental in support for organic farming in the single malt category. In 2010 we released the first single malt whisky to be made purely from Islay Barley, probably the first in the island's history. Our farmers know every inch of their land and the meaning of every cloud in the sky. Our water comes from farmer and friend James Brown's Octomore farm up on the hill behind our Port Charlotte warehouse; our Islay barley is dried in the sheds of the Wood brothers, Andrew and Neil, up the road at Octofad farm. We believe in community. We believe our spirit should speak of where it comes from and where it is matured – Bruichladdich is the only major distiller to distil, mature and bottle all its whisky on Islay. Extraordinary to think it could be any other way, isn't it? We passionately believe in terroir - in authenticity, place and provenance, in ultimate traceability. We seek to produce the most natural, thought-provoking, intellectually stimulating & enjoyable spirit possible. Obsessive? Probably – but if all you want is a whisky, the world is awash with the stuff. Our signature bottling, the Classic Laddie, is an unpeated single malt Scotch whisky that showcases our floral, elegant house style with a characteristic salt citrus tang. Each batch is carefully assembled from a suite of individual casks. "Light, fresh and full of vitality. Assertive youthful bouquet with honeysuckle, myrtle, green apple, garden mint, dry hay and oak shavings, salt and crushed sea shells. Simple and succulent, sweet flavours of home made tablet, toasted malt and mead, followed by fresh citrus fruits and ozone.
" Nose: Smoky, youthful. Plenty of peat at first with developing sherry, Madeira. Caramel, vanilla.Palate: Peaty, hay, sherry, raisins, oak, vanilla, quite coastal.Finish: Long, bold. Peat smoke, big oak." "Each release is a powerful illustration of the art of the master distiller. Each is necessarily unique, limited, finite, a celebration of nuance. It can never be reproduced. For Octomore 07.1 barley harvested from mainland Scotland was peated to 208ppm. Five years in American oak. Bottled at 59.5%. Unpeated. Distilled in 2008, this vintage expression is hand-crafted from 100% Islay-grown Bere barley, the oldest strain of barley in Scotland. Rich and malty with notes of green fruits.